Enveloped, spherical to pleomorphic, 150-200 nm in diameter, T=16 icosahedral symmetry. Capsid consists of 162 capsomers. Glycoproteins complexes are embeded in the lipid envelope. Monopartite, linear, dsDNA genome of 134 kb. The genome contains terminal and internal reiterated sequences. Attachment of the viral glycoproteins to host receptors mediates endocytosis of the virus into the host cell. Entry into host cell is still unclear and may depend on the host cell type, i.e. endocytosis versus fusion at the plasma membrane. 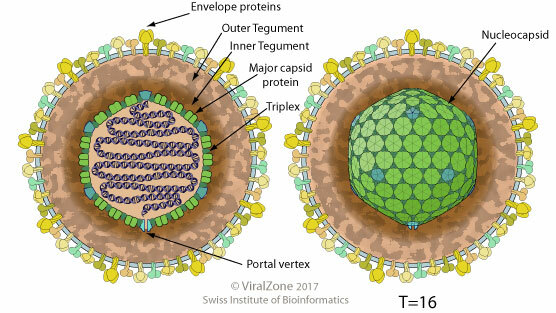 The capsid is transported to the nuclear pore where the viral DNA is released into the nucleus. Transcription of immediate early genes which promote transcription of early genes. Transcription of early viral mRNA by host polymerase II, transport into the cytoplasm and translation into early proteins. Early proteins are involved in replication of the viral DNA and are transported back into the nucleus. Synthesis of multiple copies of viral DNA by the viral DNA-dependent DNA polymerase. Transcription of late mRNAs by host polymerase II, transport into the cytoplasm and translation into late proteins. Late proteins are structural or core proteins and are transported back into the nucleus.